Diane Delves has survived and thrived in the male-dominated field of property development for two decades. 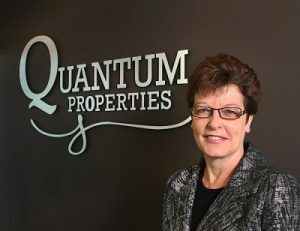 She is President and CEO Quantum Properties, which has been developing properties and constructing multi-family residential and commercial buildings since 2000. Her comprehensive real estate market knowledge and extensive industry experience guide the direction of Quantum Properties’ projects. She is also a professional real estate appraiser with more than 35 years of experience in the real estate sector including sales, appraisal, management, and development. She is also a long-time supporter of scholarships at UFV, particularly of scholarships for women in trades. The Quantum Properties Annual Scholarship for Women in Trades provides $1,000 in support for a UFV student. This year’s winner was Jaden Simpson, who studied heavy mechanical trades. Diane encourages women to pursue trades careers because there is so much untapped opportunity there. Diane has met several recipients of her scholarships. She also offers site tours of Quantum projects for UFV classes. 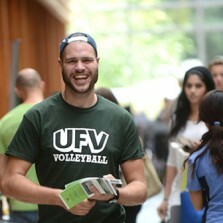 There’s a family connection to UFV for the Delves clan as well. Her son Robert and daughter-in-law Jessica met at UFV when they were students and both volunteered to be student mentors for international students. Jessica has now returned to UFV as a graphic design student, while Robert, who earned a Bachelor of Business Administration at UFV, works for Quantum Properties in development and marketing.